With so many products available on the wearables market today, consumer perception is always changing. 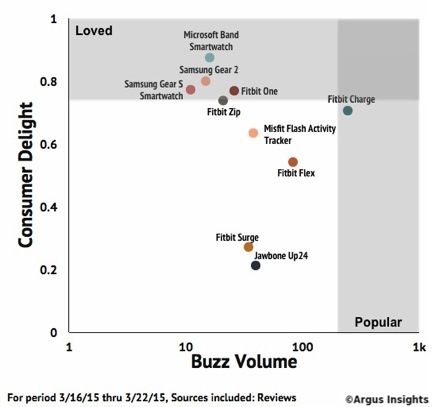 Looking to consumer reviews from last week, Argus Insights found that while Fitbit dominated in mindshare, less popular devices are truly delighting users. Will the Apple Watch be both popular and delightful? Only time will tell! Fitbit products saw the most mindshare last week, but only the One and Zip gained high praise from consumers, while the brand’s only smartwatch, the Fitbit Surge, elicited a low delight score. Less popular devices saw higher delight scores, as the Microsoft Band pleased the few users who provided feedback, while more popular products from Jawbone continue to see high volumes of negative reviews. Argus Insights is constantly tracking consumer perception of the wearables market at the product, brand, and attribute level. Keep an eye on this blog for updates on the launch of the Apple Watch, and sign up for our free newsletter to keep a weekly pulse on consumer interests in the wearables market.